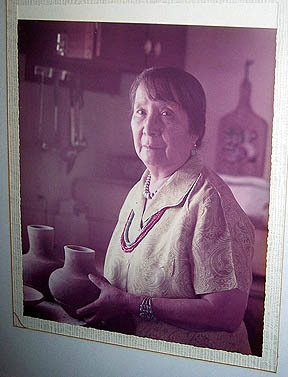 Santana and Adam Martinez both came from famous San Ildefonso pottery families. Adam was the oldest son of Maria and Julian Martinez and learned to make pottery from his parents. Santana Roybal Martinez learned from her maternal grandmother, Pino Martinez, her mother Alfonsita and her aunt, Tonita Roybal. Adam and Santana lived with Maria and Julian for several years after they were married. During that time Julian trained Santana in the fine art of pottery painting. After Julian passed away in 1943 Santana began painting for Maria until Maria began collaborating with her son Popovi Da. 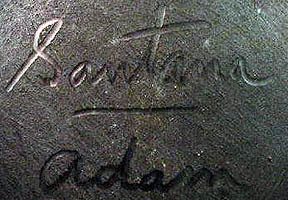 Then Santana and Adam began making pottery of their own, around 1956. They earned widespread respect for their abilities in making and painting pottery and they passed on their techniques to their seven children who have also distinguished themselves in pottery making.